In the moments after the game, when I snapped this photo, the air was rich with the smell of marijuana, wafting down from the student section were people, from seemingly every direction flooded the field in a frenzy of drunken euphoria. Between the Buckeye fans posing for photos in front of the team leaving the field with their heads hanging, and the idiots stupid enough to try and mix it up with Michigan players, it was all I could do to keep my composure and just walk away. I had to remember that I'm a credentialed media member and it's not my place to get involved. Just walk away. Props to the Michigan players for doing the same. Man, it hurts. It hurts because when leading at halftime, it felt like it might actually happen. 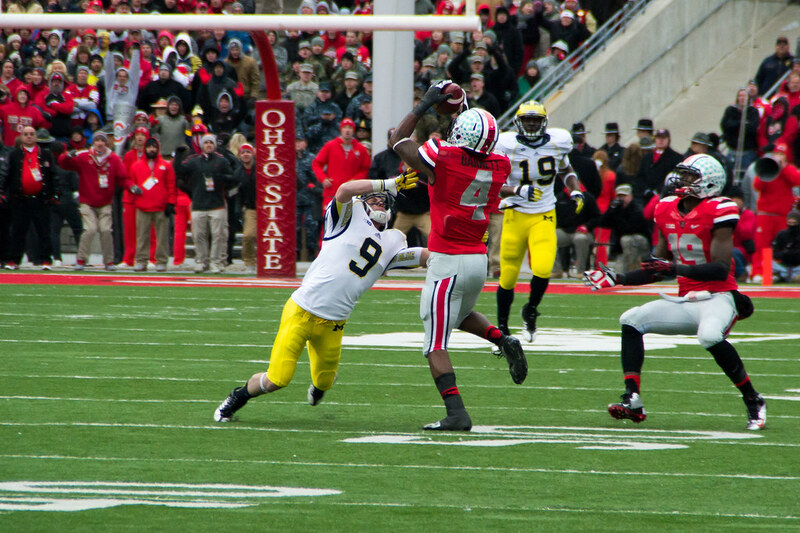 But in the back of every Michigan fan's mind, was the thought that the offense could hit the wall. We were clicking. We had kept Ohio State off balance and imposed our will offensively. 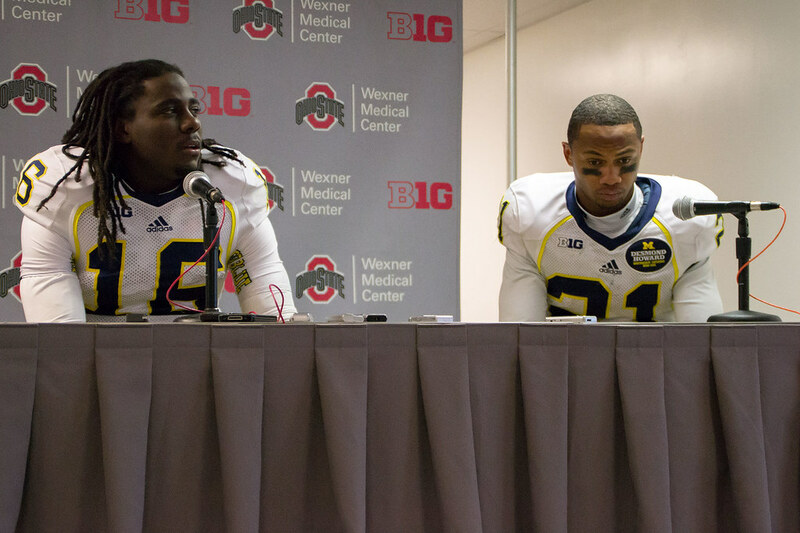 Denard was doing Denard things, and Devin was looking sharp. He was going through progressions, fergodsakes. If we could just get a few stops, we might actually do this! But we didn't. Al Borges has taken almost all of the criticism for this one, and it's tough for me to come on here and try to rationalize why he shouldn't. Michigan was having tons of success moving the ball by getting outside and utilizing Denard in fun and interesting ways. He was the key to Michigan's first half success. Why we got away from doing that in the second half is beyond me. If he was hurt, then just say so. What good does it do to play head games at this point? By doing that you redirect all the blame to Borges. If Denard was hurt, which it didn't look like he was, then what about using him as a decoy? No one knew he was hurt. Those 3rd and 4th and short calls were shameful. I like Vincent Smith, but he's not going to make 3 to 4 yards going into the teeth of the OSU defense out of the I-formation. You have two pretty good running QBs. What are you doing running Smith up the gut? Michigan needed to do more of what it did in the first half. No one should have messed with the recipe. Utilize your strength, it was working for you. Don't try to confuse OSU by doing something you're not good at. They weren't fooled. Hard to argue that this one's not on the coaches. Michigan never crossed the 50 in the second half. Big games (loses) on the road this season have been defined by turnovers. OSU was no different. We got a couple to go our way early on, but when the game was in doubt, Michigan was giving the ball away left and right. BIG props to the defense for only giving up 6 second half points after being put in terrible situations the whole half. We shouldn't let that go unnoticed. But it wasn't enough. It was snowing, it was windy, it was freezing. 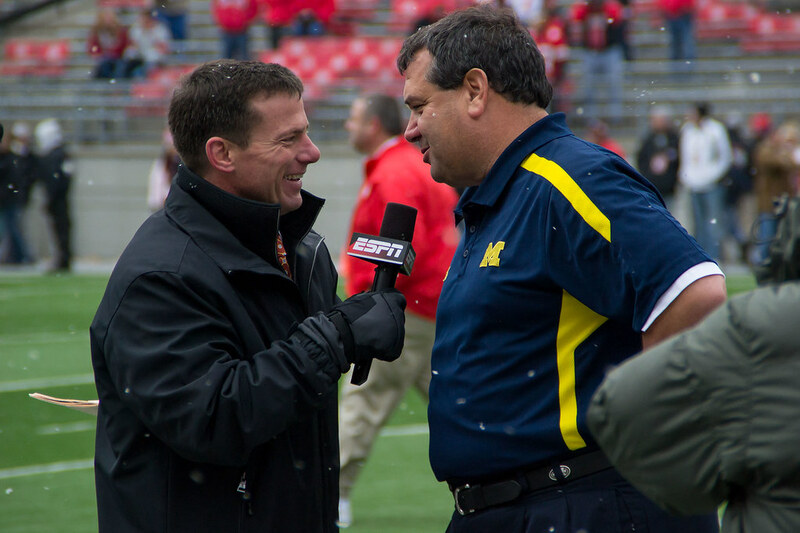 I was bundled up pretty good on the field for pregame and I was very cold. 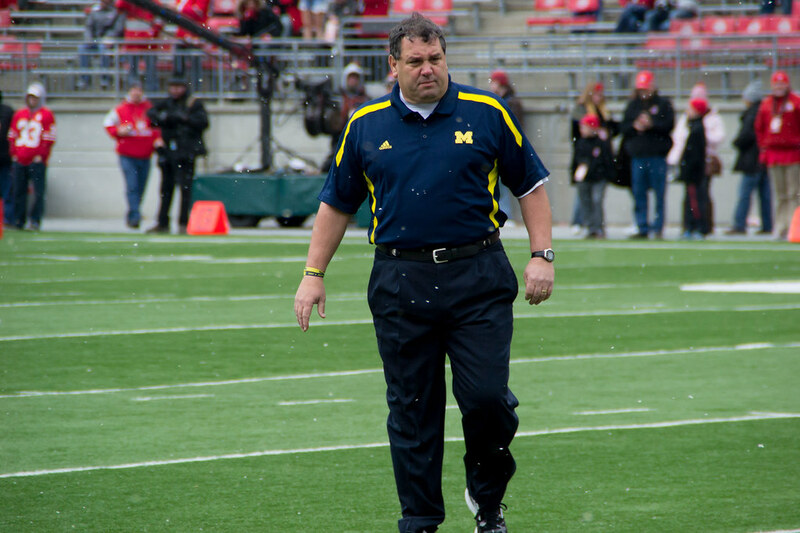 Hoke wasn't the only dude out there in short-sleeves, I saw one guy running around in shorts. But I can't image how cold he was. I really don't think he cares. Coach, are you cold-blooded? "Well..."
Pregame was pretty intense. The energy was definitely palpable. I wasn't really that cold by the time I headed back to the McPressbox. No really, there's a real actual McDonald's up there! Greg from MVictors nailed it. Agreed. The place was a hodge-podge of advertisements, bright lights and signs meant to honor Buckeye legends. I never knew what to look at, every flat surface had something bolted to it. 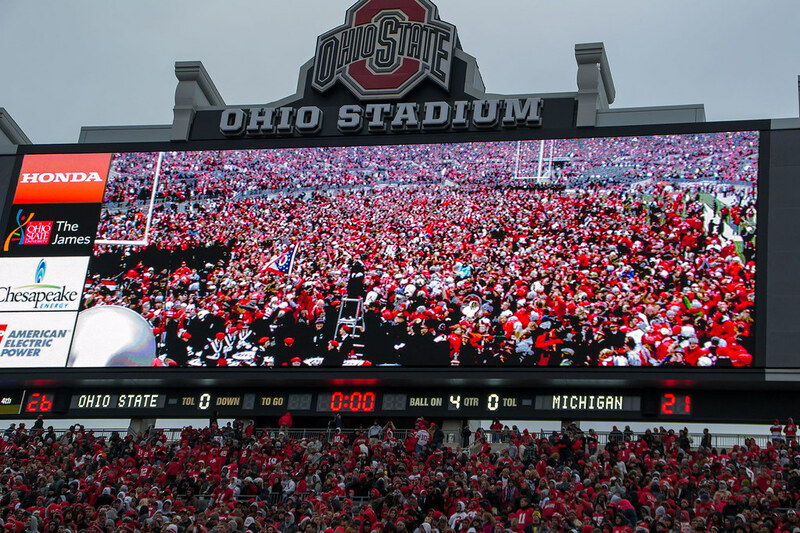 The pregame video board was essentially a 90-minute infomercial about how we're all Buckeyes and stuff and that's so awesome!!! Did every Buckeye fan just forget that this guy is the sole reason why you're "12-0 with nowhere to go" as the pressbox elevator operator put it after the game? Do you really need a refresher? After the game, up in the McPressbox, the media was treated to listening to Urban's post-game presser over the speakers. Since I was forced to listen to this, I challenge you to do the same right now. They're going to put a statue up of this guy. That look. I feel you Treezy. Post-game was exactly how this photo looks. Just outside the windows of this room (on the 2nd floor of Ohio Stadium) you could hear Buckeye fans singing. Ohio State was the better team. We all felt it. They beat us. All that's left is the very unsettling feeling of "What if?". So many questions will be asked about how this one got away from Michigan. Was it all just play-calling? Probably not. There's never always just one reason why games are lost. This game had a very familiar feel to it. We all knew coming into this season that the schedule was going to be tricky. Who knew that of Michigan's 4 big road games, those teams would be a combined 44-3 at the end of the season. It's entirely possible that Michigan's two biggest non-conference opponents will be playing for a national championship. The other two, a 12-0 Buckeye team is ineligible, and Nebraska will play in Indy this Saturday for the B1G title. 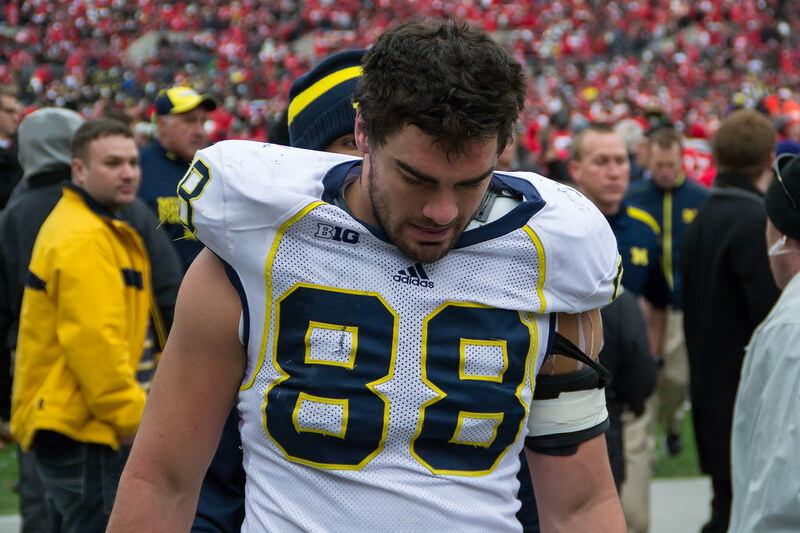 But it also speaks to the fact that Team 133 was never ready for primetime. Will this team end up being like 1996 or 2005? 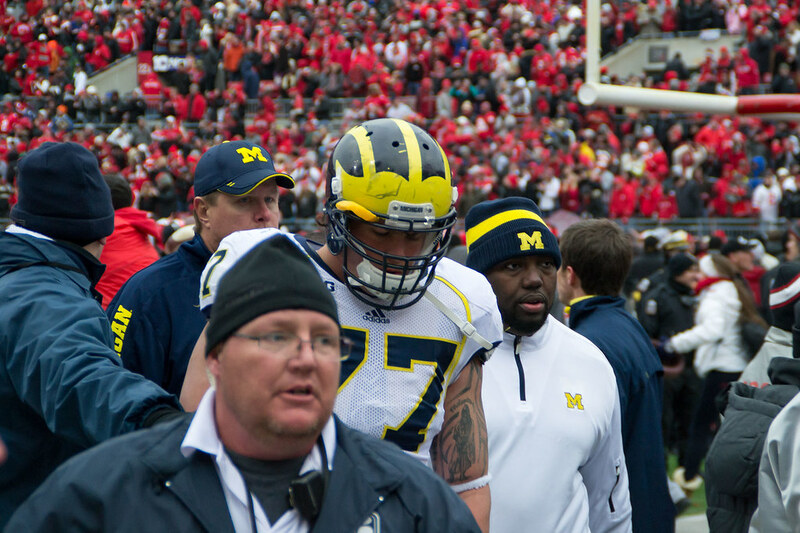 Can Michigan turn the page to set up a championship 2013 season? Now it's just on to the bowl game, and hopefully a brighter ending for Team 133.